When the City of Pleasant Hill recently decided to upgrade city monument signs, PHIG asked to repurpose one for signage in the Garden to mark the new entrance to the Garden and make it clearer for visitors. Partnering with Mt. Diablo High School ACME Academy, teacher Marco Castro tasked his Computer Integrated Manufacturing (CIM) students to refurbish the deteriorated sign. Using a laser engraver, they also created the additional Instructional Garden sign that will hang underneath. Thank you to Mr. Castro and his students for help with this awesome project! 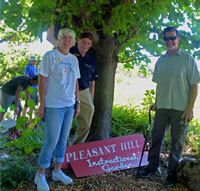 Help PHIG volunteers to mount the new signs in the garden this spring! Contact [email protected] for more info and to help us plan ahead. 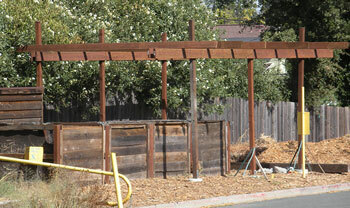 With thanks to the Pleasant Hill Garden Study Club and donations from individuals for funding, an arbor over the composting system has been added to protect visitors during events and classes and volunteers during garden work party days. It helps to moderate the temperature at the composting system. Help us finish attaching rafters and plant a vine to provide more coverage for additional educational and composting activities.